Amma, Puduvai Kalaimamani Yogacharini Meenakshi Devi Bhavanani, was born in The United States of America and travelled to India to study yoga in 1968, at the age of twenty-five. She has remained there ever since. In 1992 she finally received her Indian citizenship, an event that she describes as the proudest day of her life. Although her fair complexion is unmistakable among the dark skin Tamils in her South Indian home, she is, in every sense, an Indian woman. In my studies of yoga and my search for truth and deeper understanding in life, I have yet to meet anyone who has influenced me so profoundly. Amma, as she is affectionately referred to by all, is without a doubt my greatest teacher, although she may not even know it. That’s because she doesn’t look for personal recognition from her students. She does not seek the limelight; she has no desire for fame, fortune, or public attention. In fact, at times she can even be downright illusive. It took me a while to understand that she is not interested in becoming another object of attachment for her many students and admirers, who are already struggling to break themselves of the burden of immense worldly dependence. She is always there, though, as a true and loving guru is: watching, guiding, and above all else, demonstrating in each and every moment, through a life of absolute devotion to the teachings of yoga. She was trained as a journalist way back when, and over the years has become a prolific author and public speaker. Perhaps what first drew me to Amma was her exquisite ability to communicate profound concepts in a practical and meaningful way; and it’s in the intimate satsangas, which she shares in the evenings with her students, where her wisdom is so beautifully revealed. I have always been amazed by Amma’s insightful analysis of the “human condition.” I am humbled by her consistent capacity to convey observations in a pleasant and respectful way; a rare skill that shows a remarkable compassion for everyone and everything. 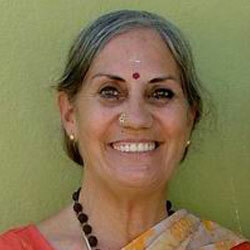 Meenakshi Devi Bhavanani is the resident Acharya of Ananda Ashram in Pondicherry, India. She is also an accomplished Bharat Natyam dancer who has trained over 10,000 village children in this ancient dance form through the Sri Kambaliswamy Yoga and Fine Arts Programme. She is the Director of Studies for the annual six-month yoga teacher training program at the International Centre for Yoga Education and Research (ICYER). 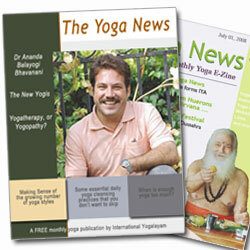 She has also been editor of “Yoga Life” magazine for nearly 4 decades, as well as the managing editor of Ananda Ashram’s publishing unit, Satya Press. She was named an eminent yoga expert to the Central Council for Research in Yoga and Naturopathy, under the Indian Health Ministry, and is one of the founding members of the newly formed Indian Yoga Association. The list of her awards and recognitions is endless; the list of her keynote speaking engagements and seminar presentations too vast to mention. Just noting all that she accomplishes in a single day leaves me breathless, yet she flows though life seemingly effortlessly, while still finding the time to be a loving grandmother to two adorable little children. Amma is grace and dignity personified and one of the brightest lights in the world of yoga today; not for all that she has done, or for all that she continues to selflessly do, but because she exemplifies, in every conceivable way, what it truly means to live a yogic life.